Every so often, as part of the Homeschool Review Crew, we get the chance to review something that is such a huge hit in my house that we end up buying more. Chara Games is one such vendor. Last year, we reviewed Commissioned, and I had to go out and buy more copies for gifts. This year, we've been playing Unauthorized, and you guessed it... I've already purchased another copy as a Christmas gift for my son. I think that tells you what my bottom line is with this review. The game is fabulous, and you should get a copy. The premise is that you are in an area with an underground church that the state is trying to stamp out. Each game includes at least one pastor, at least one police officer, and at least four players who could be for the state or could be for the church... and their loyalties can change during the gameplay. What a fantastic way to introduce the conflicts and tension of living out your faith in a place where Christianity can land you in jail, or lead to your execution. 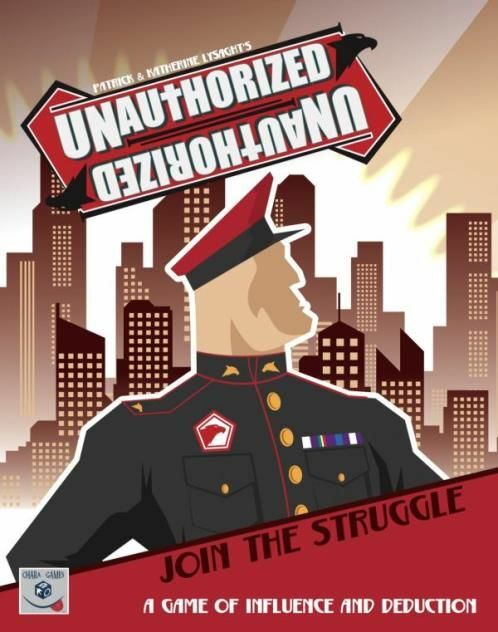 Unauthorized is a game for 6-12 players. The age on the box is 12+, but my 11-year-old was easily able to play. Patrick (the guy behind this company) assured me that they are hearing about it working well with kids as young as 8. I think with a bit of adaptation, that could be true. I wouldn't want to do it with a big group of 8-year-olds, but a couple younger people in a group of mostly 12 and up -- that could absolutely work. We pulled this out to play while college boy was home for a whole week. That meant we had seven players for the first couple of games. We also played it without Dad, with a total of six players. And played it again. And again. And again. And then we realized it was 2:30 in the morning and maybe we should get some sleep. The next day, we played it a few times more. And we tried playing two characters each, to get an idea of how it worked with 12 players. That was fun too, but sometimes a bit hard to switch from one person to another. I think you could say it was a hit here. 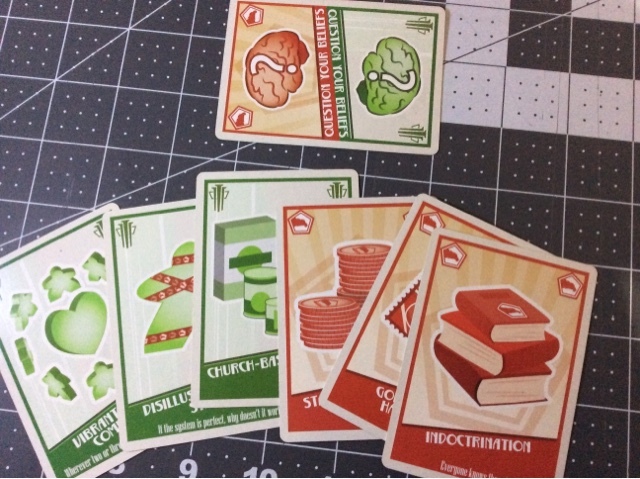 Unauthorized is a card-based game, where you are dealt a character to play, some experience cards that influence your choices, and then in 30 minutes, you play out the scenario and either try to grow the church, or try to stamp it out, depending on what your cards tell you to do. To start the game, you need to pull out the character cards, and grab the appropriate number of pastors (one for 6-9 players, two for 10-12 players) and police officers (one for 6-7 players, two for 8-12 players), and then shuffle the neutral role cards and pull out the appropriate number so there is one role card for each player. All the unused role cards are returned to the box. 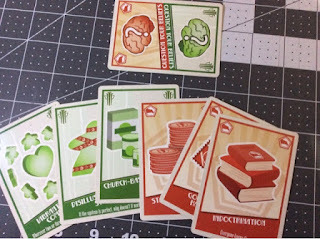 You shuffle the role cards, and deal one to each player. A cool factor is that there are different photos on the role cards, usually a female on one side and a male on the other. Each player can choose which side to have represent them. We opted to let the police and pastor choose from either card, actually. Each role -- teacher, musician, clerk, etc. -- has different abilities. So right off the bat, you have some big variations in the game when playing with fewer than 12 people. The combination of skills available in a game can change pretty dramatically. Your experience cards determine your loyalty. If you have more state cards than church cards, you must play in a way that is loyal to the state. If you have more church-friendly experiences than state-friendly ones, you must play in a way that is loyal to the church. A tie goes to the state. If you start out pretty even (3 of one, 4 of the other) you might find your loyalties switching back and forth throughout the game. That doesn't even count the fact that there are wild cards, and with those YOU get to decide whether they are pro-church or pro-state. Once everyone is set up with their role and their experiences, the game actually starts. 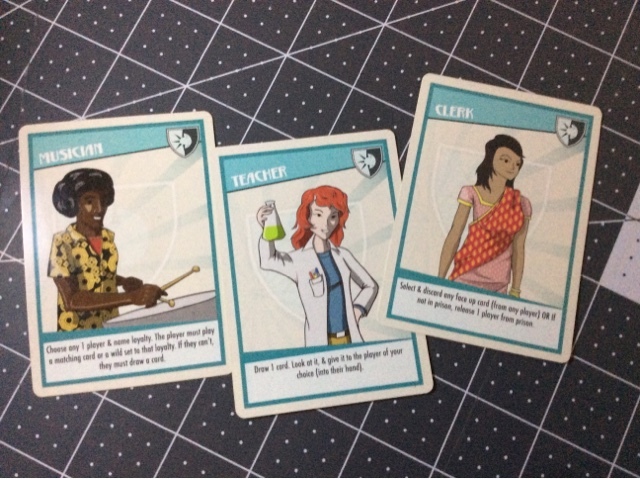 You play four rounds, and in each of your turns, you have the opportunity to try to influence another player, learn about a player, or get out of jail. Every other player may try to influence you or learn more about you. One tricky part is you are never quite sure where anyone else stands -- except the pastor and the police officer. You have some hints. Each player has at least some of their experience laid out for everyone to see. But if they have two state cards in front of them, do they have five church cards in their hand? You don't know. The kids -- ages 11-20 -- and I loved this game. The hardest part for us was playing someone who was really neutral -- 3 state cards, 3 church cards, and a wild card to start with (like the photo above), and then a lot of other players influencing us so on one turn you'd be pro-church and the next you'd be pro-state. It was hard to actually act against the church when you could clearly see that you were likely to change back to being pro-church in the next round. But that reflects reality, doesn't it? When your experiences are pretty much all favoring one side or another, it is easier to act that way. When you are waffling in the middle, neither hot nor cold, life isn't so easy to figure out and choices are harder. Get the game. It is inexpensive, pretty easy to learn, and every time you play is different.